On Thursday 19th January, Show Racism the Red Card (SRtRC) held an educational event at PPG Canalside (Huddersfield Town AFC’s training ground) in partnership with Huddersfield Town AFC (HTAFC). More than 70 young people from local primary schools attended the event which saw the Year 5/6’s take part in a SRtRC workshop, watch the SRtRC educational film and were involved in a Q&A with a panel of special guests. Pupils from local schools arrived at the training ground and headed to the room where they would spend the remainder of the afternoon. Young people from Christchurch Academy, St Thomas Primary School and St Joseph’s Catholic Primary School were surprised at the start of the event as Huddersfield Town’s Head Coach, David Wagner made a guest appearance. He spoke to the children and answered some of their questions before having pictures and signing autographs for the young fans. After a quick introduction to the afternoon the young people developed their understanding of racism by watching the 22-minute Show Racism the Red Card educational film, which provides an excellent introduction to the subject of racism. The young people had been asked to start thinking of questions that they would like to ask the panel of special guests and with suspicion building among the young people of who might be attending the Q&A it was time to introduce the panel. Current Huddersfield Town Goalkeeping Coach and former Chelsea and Republic of Ireland International, Nick Colgan, attended the event to sit on the panel for the Q&A session. Show Racism the Red Card ambassador and former Chelsea, Southampton and Huddersfield Town player, Ken Monkou, returned to his old club to share his advice with the young people. The youngsters were also joined by First Team players Jack Payne, Sean Scannell and Elias Kachunga. Young people from each school put forward a variety of questions to the panel regarding racism. How has racism worked in football? Has anyone ever been racist to you? Why are people racist? Were just a few examples of the questions that the panel were taking it in turn to answer. The current players explained to the young people what they should do if they experience racism and who they can report it to. The other panel members provided brilliant advice for the young people on how to report racism and what each person can do to tackle racism. Prizes were given out to the four best questions asked to the panel. The prize of a signed Football which had generously been donated by HTAFC was awarded to for the best question asked on the day. The club also generously donated match tickets meaning that every young person in attendance got one Junior and Adult ticket for the weekends game vs Ipswich. After a short break the young people then went into an educational workshop which was conducted by Campaign Worker, Ben Holman, from SRtRC. The workshop made young people explore stereotypes and think critically about the way in which we stereotype. The young people engaged in thoughtful and honest conversation with their peers about the dangers of stereotyping. 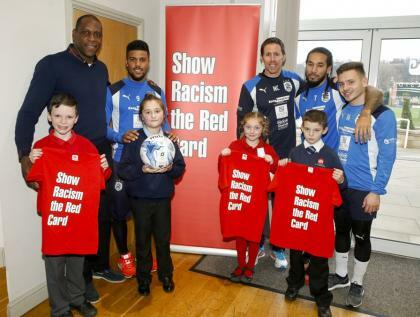 Show Racism the Red Card would like to thank everyone at Huddersfield Town AFC for their support in organising the event and for their continued support of the campaign. A big thank you to Andy Booth and Rachel Taylor at HTAFC who make the event possible. The power of role-models to educate young people should never be underestimated, therefore, a massive thank you to Ken Monkou, Nick Colgan, Jack Payne, Elias Kachunga and Sean Scannell. And finally, Show Racism the Red Card would like to thank all the young people for their honest engagement from start to finish.